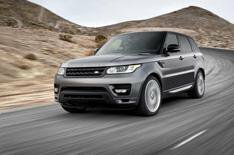 Range Rover Sport pricing confirmed | What Car? UK prices and specifications have been confirmed for the new Range Rover Sport, with a starting price of 51,500. There are four trims to choose from: SE, HSE, HSE Dynamic and Autobiography Dynamic. Customer deliveries of all models except the SE will begin in the third quarter of 2013. However, buyers who choose the entry-level car will have to wait until January 2014 at the earliest. The three engines available are the 255bhp TDV6, 288bhp SDV6 and the 503bhp supercharged 5.0-litre V8 petrol. A V8 diesel and a diesel hybrid are expected to join the range later. Buyers who want the 5.0-litre supercharged V8, will have to go for Autobiography Dynamic trim, which is also available with the SDV6 for those who prefer a diesel. SE spec is only available with the TDV6 engine. Standard equipment across the range includes, automatic headlights and windscreen wipers, auto-dimming rear-view mirror, a powered tailgate, intelligent stop-start, four-corner air suspension and Land Rovers Terrain Response system. Cabin equipment features two-zone climate control, heated front seats, DAB radio, HD navigation and voice control. HSE specification priced from 59,995 adds 20-inch alloys, Oxford perforated leather, 14-way adjustable electric front seats with memory function, heated rear seats, power steering column adjustment, paddle shift controls, heated windscreen and rear-view camera. HSE Dynamic costs 5000 more than standard HSE trim, and gives you stainless steel pedals, a bright finish for the twin exhaust tailpipes, gloss black grille and vents, 21-inch alloys, twin-speed transfer box, torque vectoring and the more advanced Terrain Response 2 Auto system. Top-spec Autobiography Dynamic trim starts from 74,995 and adds High Beam Assist, interior mood lighting, the Meridian Surround Sound audio system, adaptive cruise control with Queue Assist, and a safety package that includes emergency braking and active front seatbelts. Personalisation options on the new Range Rover Sport increase as you go up the trims, extending to 17 choices of exterior paint finish and 11 interior colour themes on Autobiography Dynamic cars. Customers can also choose from four aluminium finishes, three headlining colours, seven alloy wheel designs, three contrast colours for the roof and three finishes for exterior accents. Other technology such as the Wade Sensing system which monitors depth when driving through water and dual-mode Park Assist are also available as options. The new Range Rover Sport is available to order now with deliveries of HSE, HSE Dynamic and Autobiography Dynamic cars scheduled to commence from the third quarter of the year.